Timeless, Sophisticated and Stylish! The 1930’s design is popular even today. It has been made iconic by Ryan O’Neal who starred in Peyton Place, as Rodney Harrington. Interesting fact: That’s where the Harrington Jacket got its name. Up until then it was called the Baracuta G9 Jacket. The jacket is versatile, functional and popular with all the culture groups. Anybody can wear a Harrington Jacket and look great. But in case you are wondering just how to go about it, then check out some cool tips to look awesome in this jacket. Do your research and get a Harrington Jacket that fits you perfectly. Check out our Fitting Guide for more details. A great way to sport this jacket is by layering it. 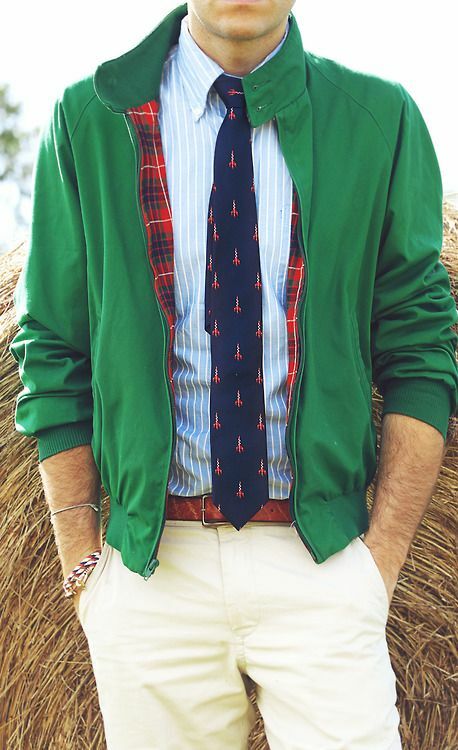 You can try the button down shirt and jumper look along with this jacket for a preppy look. Wear it with chinos or denims. The most important tip with regards to a Harrington Jacket is to be comfortable and confident.